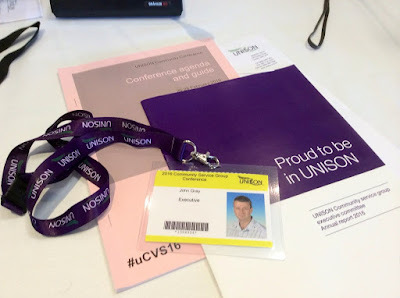 Today I was in Southport for the start of the 2016 Unison Community (Housing Associations and voluntary organisations) seminar and conference. I have never been to Southport before and am really impressed. It is a beautiful resort and reminds me of Llandudno in North Wales. I went for a run along the beach in the morning. Before the start there was a meeting of the Community Service Group Executive then the biannual Housing Associations' sector meeting. The reps for a number of different housing organisations met and exchanged ideas and experiences. The seminar kicked off with key note speaker, the Unison Assistant General Secretary for organising, Roger McKenzie. Roger promised that the union must and will change. We are no longer a one employer, one branch union. We have to modernise. Next was workshops on TUPE, Work related stress, Equality Act, recruitment and training. I took notes for a report back on recruitment. This evening we had regional and branch delegation meetings. We are all off now for a delegation meal next at the "Hungry Horse". Sounds like my sort of restaurant. Will post further as and when.